Leave a comment on THIS post by 6 p.m. CT Tuesday, February 24, 2015 to be entered in the DRAWING for a copy of the book below. If you mention in your comment that you’re a follower (see in the left sidebar “Join This Site” and “Follow by Email”), I'll add your name a second time in the drawing. U.S. mailing address required to receive a paper book. Read book giveaway details at Disclaimers. To provide you security, please leave your email address like this: johnATyahooDOTcom. Winner announced in next Thursday's blog post. 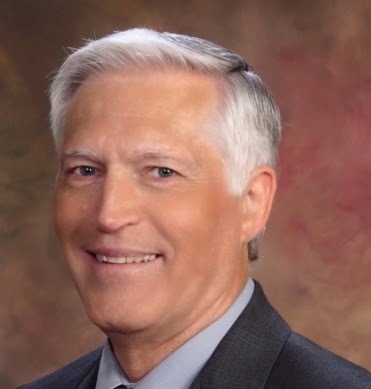 Our guest today is H. L. Wegley. Harry has been an intelligence analyst (USAF), a Weather Officer, and a research scientist, where he published in the scientific literature. After earning an advanced Computer-Science degree, he developed computing systems for 20+ years then retired to write. He has a contracted 4-book, inspirational thriller series (with romance) with Pelican Book Group. The 4th book, Triple Threat, released in November 2014. He’s currently finishing his 8th novel, a political thriller. Welcome, Harry! If you could have dinner with one person from today or history (except Jesus) who would it be? We've already gotten an invitation to a dinner with Jesus, the marriage supper of the Lamb. My choice would be someone near the other end of the religious spectrum, Charles Darwin. I would like to sit down with Mr. Darwin, let him tell me about using morphology to define species and using a tiny blob of his “stuff of life” to define a cell. Then I would tell him about what he was terribly ignorant of in 1859, the universe that exists inside a cell's nucleus, about DNA, coded information that prescribes life by prescribing a particular organism within a species. Hopefully, he would realize that basing his theory on morphology had no merit. Perhaps the lights would come on and, after I told him what a shredder was, maybe he would feed On the Origin of Species to one. Please tell us a little about your novel, Triple Threat. previous story, Moon over Maalaea Bay. Katie has an IQ of over 180, is very athletic, but now is a beautiful young woman who‘s about to turn 21. She’s is finishing her dissertation for a PhD in Computer Science. Back to the story—Triple Threat is the 4th book in my Pure Genius Series, a high-action, romantic suspense story about Katie and another early twenties PhD candidate. During their dissertation research, Katie discovers a planned terrorist attack that dwarfs 9-11. In one thread of the story, there’s a sweet, first-love romance that’s soured at times by opposing worldviews. Katie’s a Christian. Josh is agnostic. The other thread contains a three-pronged terrorist attack that could cripple our nation, indefinitely. The way I chose to intertwine the threads leads to an entertaining, action-filled, humorous, and often romantic story line that keeps readers on the edge of their seat without being graphic or scary. Katie’s actions may stretch the bounds of believability a bit, but that’s why Josh calls her Crazy Kate. Over the course of the story, the reader gets to see Katie field Josh’s questions, answering nearly every major objection raised against Christianity. But, I hope the readers notice that the most convincing things to Josh are Katie’s life and the working of God in Josh’s heart. Answers are great and we’re commanded to have them (1 Peter 3:15). But the greatest apologetic we’ll ever have for our faith is our life. Where can readers purchase Triple Threat? Readers can expect an important announcement from me later this year. If all goes according to plan, you’ll hear about it in 8 or 9 months. No, I’m not running for political office, and I’m certainly not having a baby. Harry, thanks for visiting with my readers. One of the commenters will win a copy of Triple Threat, which you have offered. The winner of last Thursday’s blog post for a copy of The Heiress by Mary Ellis is Charissa. I’ll email you. Thanks all for commenting. Watch for more book giveaways. I have not read the other books in the series. Would that hinder my enjoyment of this one? Based on your post, I'm sure I'll be out looking for the rest anyway, but would love to win! Thanks for a great post. Marianne, you're welcome. Glad you enjoyed the post. Thanks for coming by and leaving your comment. Marianne, Several people have read Triple Threat first and said it stands alone fairly well. I am having difficulty in leaving a comment on this post. I would so love to win this book by H.L. Wegley. It sounds so interesting and intriguing and I have never read anything by him or by you, Jo. Thanks for this contest. Hoping to win. Mary Lou K flowersmarylou85ATgmailDOTcom. Mary Lou, you're welcome. Glad you've found a new author in H.L. Wegley--and you can see my books to the left. Thanks for commenting. Wow! I'd love to win this book. I seldom read novels by men writers, but this sound like the kind of story I'd enjoy immensely. I especially liked his comment "Answers are great and we’re commanded to have them (1 Peter 3:15)." So many times we as Christians fail to have the answers when someone asks us about why we believe in Jesus or the Bible. We all need to study the Word more and be prepared. I'm a follower and subscriber, Jo. Ann, thanks for leaving your comment. I appreciate your following my blog! This book looks really good. I am following your blog now. Virginia, thanks for following my blog! Glad you left your comment. Hi Harry & Jo. 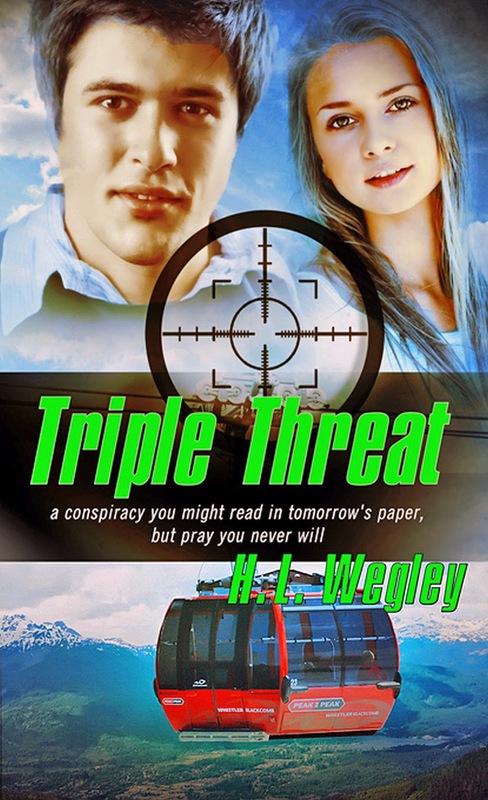 Like Mary Lou, I have no idea if my comment was accepted, so am resubmitting As you know, Harry, I already have a copy of Triple Threat, so there is no need to enter me in the contest. I just wanted to stop by to say hello since Harry is one of my favorite authors. I can attest to the fact that he writes action-packed, intriguing books You'll always find some romance as well as a valuable message. Thank you for the kind words, Patti. I am not familiar with this author but his books sound like something I would enjoy reading. Janet, glad you've found a new author. Thanks for leaving your comment and for following my blog! Hi Jo. Thanks for inviting Harry as your guest. I have one of his books. I would like to win this one. I am a follower of yours and a subscriber of yours.